HANOI, Vietnam — Everything was going so well. The White House messaging on the president's 11-day trip to Asia has been trade-related. And when President Donald Trump wasn't talking trade, he was talking North Korea. All according to plan. But even the best laid plans can go awry when Trump gets in front of reporters — which he did on Saturday afternoon after spending the day mostly out of view while at the APEC summit here. 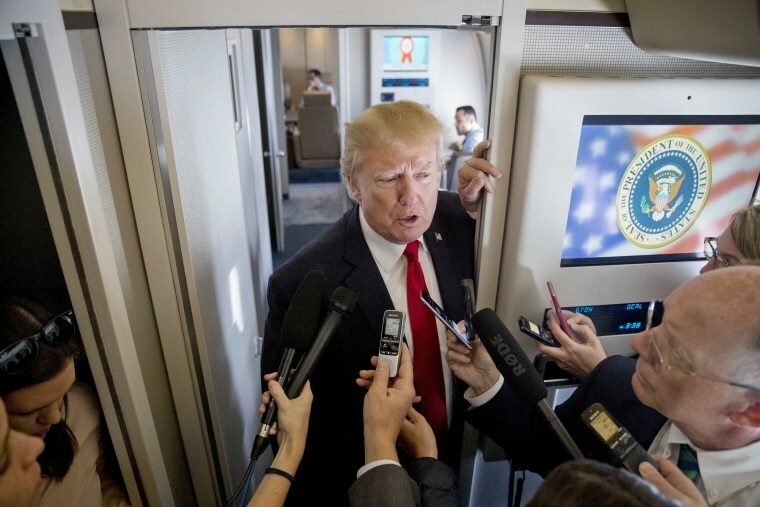 He was asked multiple times about his short face to face with Russian President Vladimir Putin, and suggestion to reporters aboard Air Force One that he believed the sincerity of Putin's denial of any election meddling. Trump caught so much heat for those remarks that he had clarify those comments the next day. "I'm with our (intelligence) agencies," Trump said, cleaning up his earlier statements by aligning himself with those that believe Moscow did in fact interfere. Trump also launched defensive tweets, casting off the "haters and fools" who doubt his approach to a more positive relationship with the Kremlin. On North Korea, the president starting a name-calling battle with leader Kim Jong Un, who Trump says insulted him by calling him "old." The president returned the compliment by tagging Kim as "short and fat." But it's still possible the two could become friends, Trump insisted. While the president's working on his messaging — planned and off the cuff — his aides are kicking off a new effort to get their views across. Flipping the script on what Trump derides as "fake news," the White House is debuting "Resolute Reads" this weekend to highlight in a regular email newsletter what aides deem to be "real news." Resolute Reads will focus on what one White House official described as "real news from around the country...the president wants to be sure the American people don't miss." The first edition includes links from local media outlets, as well as Reuters and Bloomberg, along with Breitbart, the media organization headed by former White House chief strategist Steve Bannon, which last week published a marking the one-year anniversary of Trump's election win. The administration currently circulates media items that bolster messaging efforts on tax reform or healthcare in a "West Wing Reads" e-letter. And his campaign started a "real news" Facebook show highlighting positive news about the president earlier this year, featuring Trump's daughter-in-law Lara Trump and well-known Trump surrogate Kayleigh McEnany. "Too often the press misses real stories about how policy impacts every-day Americans and about the ways the administration's accomplishments are making a difference," the official told NBC.